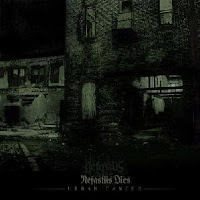 So intimidating is the onslaught of whirring guitars and blastbeats on Nefastus Dies' debut Urban Cancer (originally released in 2006) that it's pretty easy to miss the complexity of the songwriting -- most of the Canadian black metal band's time signature and tempo changes get lost amidst a hail of belt-fed drumming and a pretty restricted dynamic range (i.e. really loud). The intensity rarely flags, and yet there's a fiery melodic bent to Urban Cancer that gives the each song that de facto narrative quality so necessary when it might stretch out between 7 and 13 minutes. The rhythm section certainly pays in blood and sweat, and keyboards are used as light harmonic accents instead of de-fangers. Jury's still out on whether vocalist Ill-Fate is holding up his end of the bargain though. Often his vocals are layered with no particular relation to the rhythmic patterns underneath, and he delivers most of them in an angry scream far better suited to his former band, the Canadian metalcore standard-bearers Ion Dissonance. It's odd to hear a homicidally angry dude unleash heady philosophical conceits, as with this decidedly non-anthemic bit from "Primal Chaos Layers:"
What is subsequent is a spiritual nightmare"
But hey, I s'pose I'd prefer poetry set to Ill-Fate's arsenal of screams and pig squeal over meaningless gibberish in a more "pleasant" black metal rasp. Visit Nefastus Dies on the web, or listen to 'em on MySpace.